I’ve got a very special treat for all of you in the form of a two page spread! This took nearly two weeks just to ink and color but it was a very fun spread to plan and create. The fact that hipsters in general have evolved so much since I did Mission 004 back in 2013 I had to come up with all new complaints for Eagleheart to have about them. 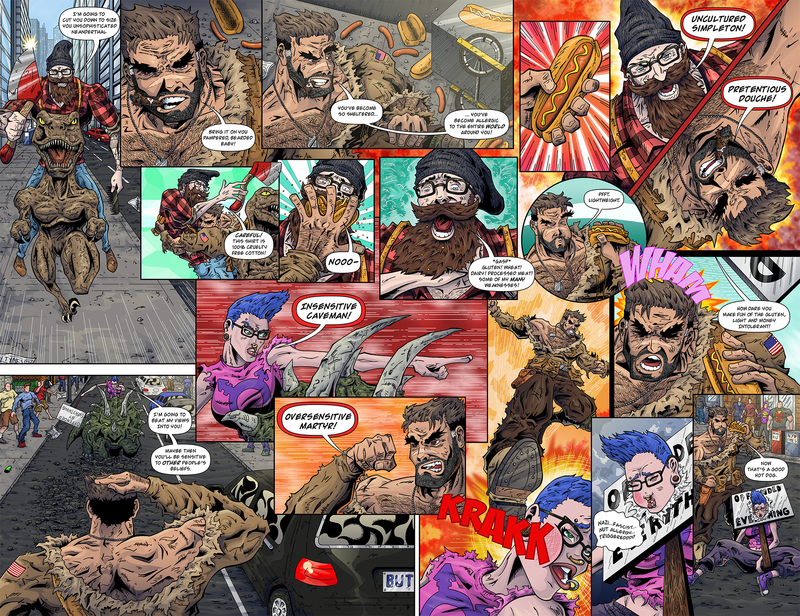 My hope is that I pushed the stereotypes far enough that even hipsters can laugh at the weak lumberjack or easily triggered SJW. You can see the full size version of this two page spread here. The rest of the issue is right on track to be completed for the end of March. If I can keep this pace up I should still be able to post a new page every week. Keep your eyes on Facebook, Twitter and Instagram @TSComic for all your updates when new pages go live.